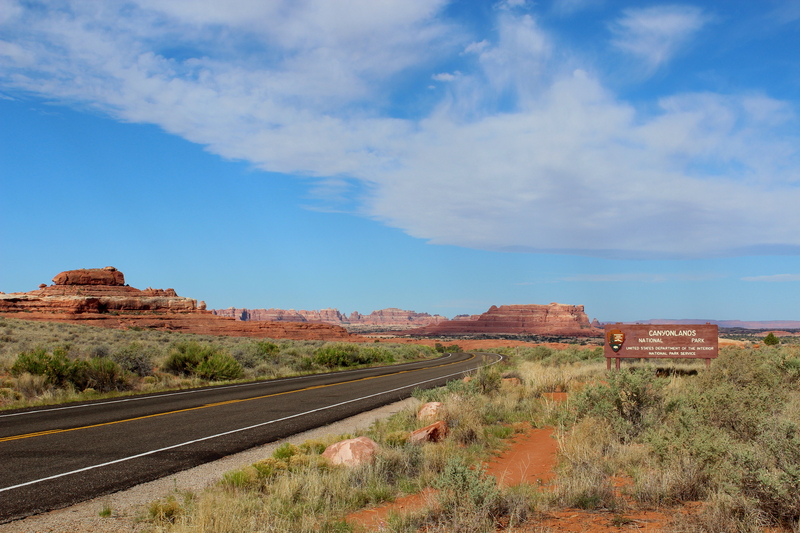 We entered Canyonlands National Park in The Needles district on the Friday of Memorial Day weekend and sought to get ourselves acquainted with the short trails along the main road before heavier traffic arrived. There is a self-guided nature trail showing typical flora & fauna and a Native granary and a trail to a cowboy campground just off the paved road. All around are the beautiful layered and eroded rock formations that give this section of the park its name. All of these seemed to serve as an introduction to the landscape, but every long view we got that day made us eager to leave the paved road and the congested trail loops and get out further and deeper into this tremendous terrain. So we decided to head up to our cooler campground for the afternoon and get a very early start the next day on a longer hike. This entry was posted in Traveling and tagged Canyonlands National Park, desert, travel, travel photography, Utah. Bookmark the permalink. It’s a stunning landscape, for sure. You got it exactly! Heart-opening is the ultimate exercise. You put it so well! We are planning on meeting my parents in Canyonlands this fall. Your amazing pictures make me want to go now! You have much to look forward to, then! OMG fantastic read!!! Nice! Keen to follow your writings 🙂 I just done the druid hike. Would love if you could check out my artistic expression and let me know your thoughts? Maybe we could even share each others blogs on our fb page? Great pictures and wonderful, fanciful expression! I think you have great style, but I also think you will improve if you slow down and proofread your text more carefully. Thanks for sharing your hike. Canyonlands is truly epic and magnificent. Star Wars music would definitely fit! Thanks for your advice pal 🙂 I really do need to work on my spelling, i just feel the pressure of keeping my blog alive by writing as I travel. But im going to get help on that and market it way better when I get home.